An interesting thing happened the other day as I strolled in to one of my local grocery stores. Before I even made it through the door there was a massive OREO cookie display. The thing looked like they probably used a cool grand in cardboard to make it. An Oreo castle, peppered with little shelves here and there to display packages of original Oreo's. Boring right? But then, in the very middle of this display there two meager facings of an Oreo cookie that probably never should have been made. But my friends...they made it. Yes, that's right. Oreo went and decided to give us a present this Easter, by mimicking a classic Easter candy treat. One that, to my knowledge, I have never met anyone who likes. Seriously. Think about it. You've probably eaten a Peep or two in your day, right? But I bet you never bought them. I bet your Mother or Grandmother put them in an Easter basket for you, and when you finally had finished all of the good candy, you would turn your sad gaze upon that box of sad little sugar birds. When you rip the bag open your nose is instantly assaulted by the unmistakable sweet marshmallow scent. These definitely smell like Peeps. Whatever poison they add to a Peep to make it a Peep? These Oreo's have it. Perhaps that's tied into their color too. 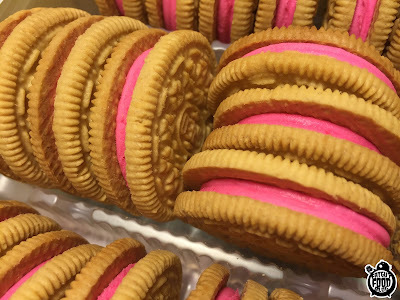 For, you see, these cookies have the brightest pink creme you have ever seen in your life, guaranteed. It's a shade of pink so vibrant that it almost hurts your eyes to look at it. But the real question, as always, is do they TASTE like Peeps? The quick answer, is hell yes. They honestly do. At first bite I thought they reminded me a lot of the Marshmallow Crispy Oreos from a couple years back. Very similar flavor! 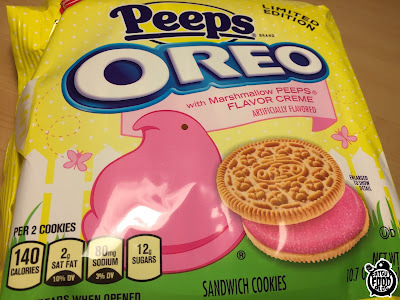 But where those had tiny rice crispies in them to give you that familiar crunch, the Peeps Oreo's have big sugar chunks for you to crunch up. It works in two ways. One, it gives you another texture while eating them, which is always fun. But the sugar also is a throwback to how the Peeps have that strange sugary skin protecting their marshmallow guts from the outside world. They really do nail the flavor, but it seems like a slightly different marshmallow. 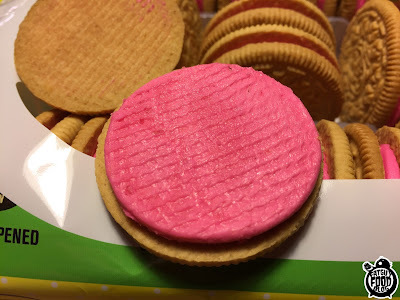 So when paired with the cookie and the sugar crunch, you get a pretty interesting cookie! There is a down side though! Most people like to twist the Oreo open and eat the creme first. Let me tell you, with these cookies, that is a mistake. I found that without the cookie to reign it in a little bit, the creme alone sort of tastes like poison. Sweet, sweet poison. Is it the abundance of food coloring? Some kind of witchcraft? Who knows. All I do know is that when I ate that creme alone, I almost spit it out! So that definitely takes these cookies down a notch, but keep them together and it shouldn't be a problem. While I always applaud Nabisco for trying wild new flavors of Oreo, I have to say, this is one that I'll be glad isn't going to be on the shelves too long. I found them to actually be pretty tasty, when it came down to it, but I probably wouldn't get another bag. 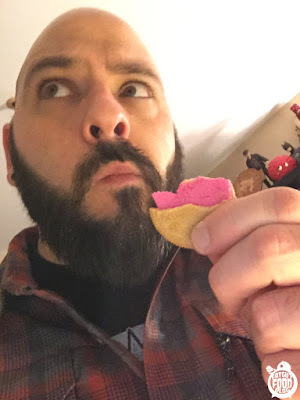 They did remind me of the Marshmallow Crispy Oreos, but the threat of the creme tasting like poison when eaten alone did knock them down the ladder a few rungs. Peeps just aren't good. Peep Oreos? Way better than just Peeps. 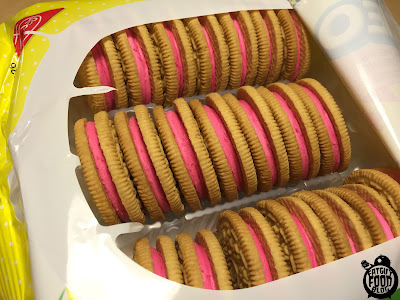 But they are still Oreo's made to taste like THE worst Easter candy. I give Peeps Oreo Cookies a solid C+. Worth a one time buy just for the gimmick, especially if you break them out on Easter Sunday, but you most likely wouldn't buy them again on your next trip to the supermarket. Review by Rich Brunelle, currently writing out of sweltering New Hampshire. 86 Degrees in April. Ridiculous.